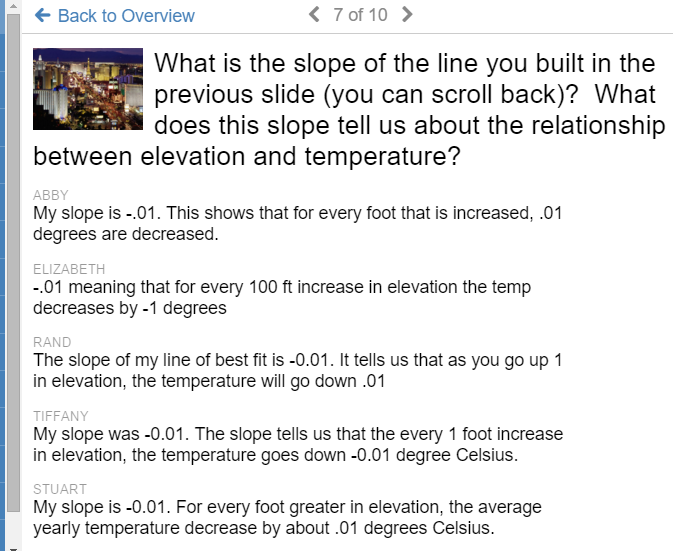 The super-awesome Desmos folks set Activity Builder into the wild this past summer, and it’s been exciting to see the creativity gushing from my math teaching colleagues as they build activities. So far, I have used Activities with 2 of my classes, with mixed success. 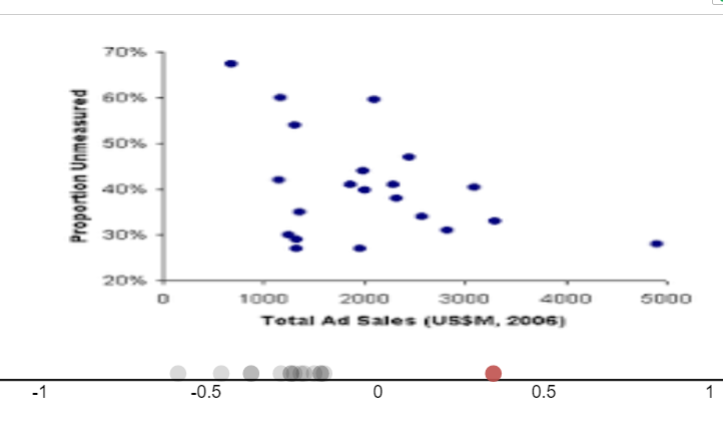 In my 9th grade Prob/Stat class, I built an Activity to assess student understanding of scatterplots and lines of best fit. You can play along with the activity if you like: go to student.desmos.com, and enter the code T7TP. I am most excitied by the formative assessment opportunities an activity can provide – here are 3 places where I was able to assess class understanding. 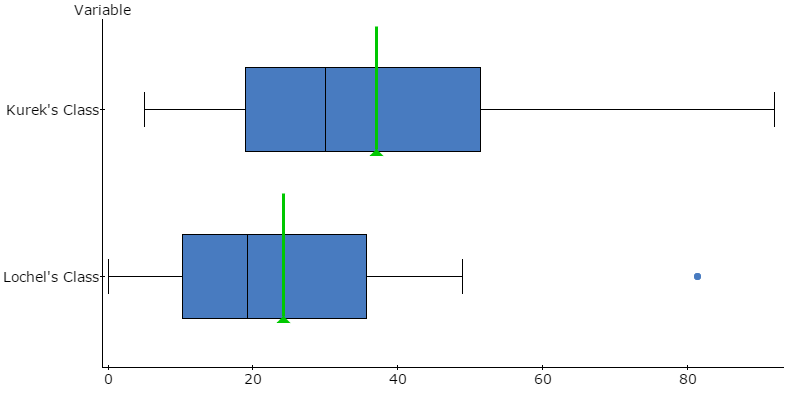 In one slide, students were shown a scatterplot, and asked to slide a point along a number line to a “reasonable” value for the correlation coefficeient, r. The overlay feature on the teacher dashboard allowed me to review responses with the class and consider the collective class wisdom. In another slide, students were again given a scatterplot and asked to set sliders for slope and y-intercept to build a best-fit line. Again, the overlay feature was helpful, though it was also great to look at individual responses. This led to a discussion of that pesky outlier on the right – just how much could it influence the line? Finally, question slides were perfect for allowing students to communicate their ideas, and focus on vocabulary. In our class debrief, we discussed the meaning of slope in a best-fit line, and its role in making predictions about the overall pattern. But all has not been totally sunny with Activity Builder. In my Algebra 1 class, I built an Activity to use as a station during class. Splitting the class in half, one group worked with me on problems, while the rest worked through the activity, then flipping roles halfway through class. 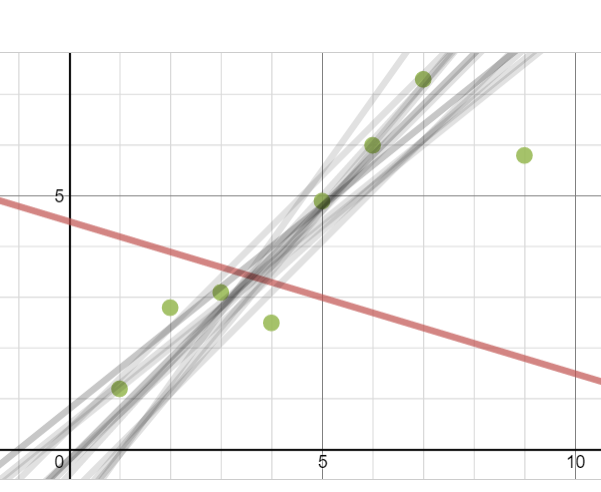 You can try this activity at student.desmos.com, code 3FGM. Leading class through an activity beforehand would have been helpful. In the future, I’m going to make a vanilla lesson which walks students through simple tasks – dragging points, answering questions, entering equations, adjusting sliders – and let them see how I can view and use their responses. Just setting a class into the wild, especially a class which often struggles with instructions, didn’t work so hot. Experience activities through a student perspective. Start building their own activities. When is the best time in a unit to use an Activity? So far, I have used it as an intro to a unit, and also as a summary of a unit. The difference is in the approach to task. An intro activity should invite students to explore and play, and think about generalizations – include lots of “what do you think?” opportunities. In my summary activity, I asked specific questions to see if students could communicate ideas based on what we had learned. Think about how you will leverage to teacher dashboard to collect and view ideas. How does the overlay feature let all students contribute and build class generalizations in a new way? How will you highlight individual student responses to generate class conversation? Ask efficient questions. There’s really not a lot of room in the text for long-ish tasks. Keep things short, sweet, and focused. Many teachers wanted to know more about building draggable points. The way I do this is to create a table, enter some points, and use the Edit feature to make the points draggable. Your best bet may be to take an already existing activity and pore through its engine, which reminds me…. Desmos is now assembling an searchable archive of vetted activities. Go to teacher.desmos.com, and use the search bar at the top-left. I highly recommend any creations by Jon Orr, Michael Fenton and Christopher Danielson. And finally, an exciting new feature to Activity Builder just appeared today – you can now copy slides within an Activity. 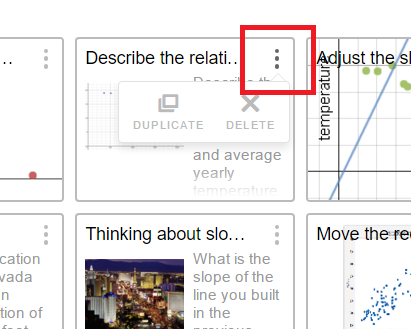 Click the 3 dots to duplicate a slide and use it again, or edit a graph to use later. It’s been a busy month of October. I don’t have a new lesson or resource to share this time – instead, here are some things which have been rattling around my brain. Last night at the weekly Global Math Department online meet, NCTM President-Elect Matt Larson shared new and “in the works” resources for members, and a revised vision for PD in the coming years. In the past few months, I have been fortunate to speak personally with both Matt and current President Diane Briars, and I am happy to hear that NCTM not only values the work of the Math-Twitter-Blog O-Sphere, but are now beginning to take lessons from the successes of ourline community and bring it to the national organization. With regional conferences starting this week, I am most excited to see a new website NCTM has established to encourage ongoing dialogue: http://regionals.nctm.org/. I won’t be able to make any of the regionals, but will be checking in from afar on this new site. I’m already enjoying the sharing from presenters, and the sense of ongoing discussion. I re-arranged my bedroom furniture this summer, and I’m not sure I like it better. This afternoon, I took one of my daily walks through the neighborhood, with the Bill Simmons podcast as my companion. His guest was Judd Apatow, and the conversation turned towards the negative aspects of celebrity. Judd mentioned Eddie Murphy who started as observational comic, then became hugely famous, as someone whose work was altered by the seclusion of celebrity status. No longer able to make the every-day connection to his audience, the observational aspect of Eddie’s career withered away, and was replaced by other things. Judd Apatow, sensing a need to re-visit his comedic roots for inspiration, dusted himself off to do stand-up and has caught his comedic second wind. Is there a lesson here for teachers who leave the classroom to become administrators? How long does it take for separation from the classroom to take root – and can (and should) it be re-visited now and again? I have 3 quite different preps this semester, and I am professionally miserable because of it. With block scheduling here, teachers have 3 courses each semester. Now and then, 3 preps is not a big deal. But I teach each course with someone different (or a different group) from the department, and I rarely share prep with any of them. I’m also the only member of my department to have 3 preps, and this is the second semester in a row this has happened. OK…I’m getting real close to my whining quota here, but I don’t think I am doing a good job right now. Instead of having laser-focus on my courses, I find myself all over the place. This is not helping my students and I am worried. Some of my AP students report that they will go trick-or-treating next week. For me, high school age is when you are out of the candy loop. Am I right? My Math Club kids are the most enthusiastic bunch I have “coached” in recent memory. And the weekly Math Madness contests have been great for getting kids to talk about problem solving approaches. I don’t usually enjoy doing math for competition’s sake, but we have been holding weekly de-briefs after each contest and the conversations have been informal, spirited and genuine. I’m lucky to work with such a great group of kids! My new local hero is a colleague of mine at my school who teachers Anatomy and Physiology, Chris Baker. In addition to being an awesome role model for kids, and someone passionate about his craft, he has jumped deeper into the Twitter pool and has embraced 20% time as part of his classroom culture. Consider giving him a follow – he’s a good egg! The book Making It Stick – the Science of Succesful Learning has caused me to consider how I approach practice and assessment in my math classroom. The section “Mix Up Your Practice”, in particular, provides ideas for considering why spaced practice, rather than massed practice, should be considered in all courses. My colleague and I teach the same course, but on different floors of the building during different periods. Each class was given bean bags to toss, but with different practice targets to attempt to reach. In my class, lines were taped on the floor 10 and 20 feet from the toss line. For Mr. Kurek’s class, one target was placed 15 feet from the toss line. After every student had a chance to practice (and some juggling of beanbags was demonstrated by the goofy…. ), I picked up my tape lines, and placed a new, single line 15 feet from the toss line. 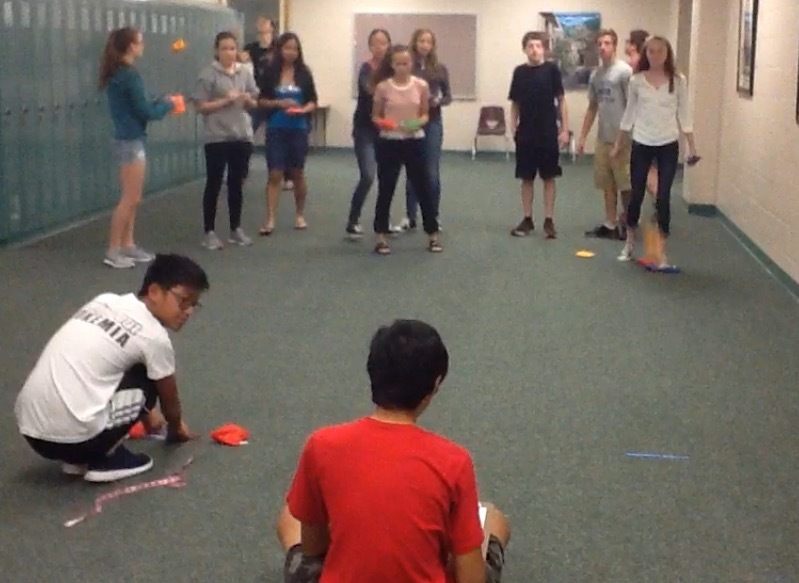 Each student then took two tosses at the target, and distances were recorded (in cms). I love when a plan comes together! The students, who did not know they were part of a secret experiment, were surprised by the results – and this led to a fun class discussion of mixed practice. Here, the mixed practice group was associated with better performance on the tossing task. Totally a “wow” moment for the class, and a teachable moment on experimental design.